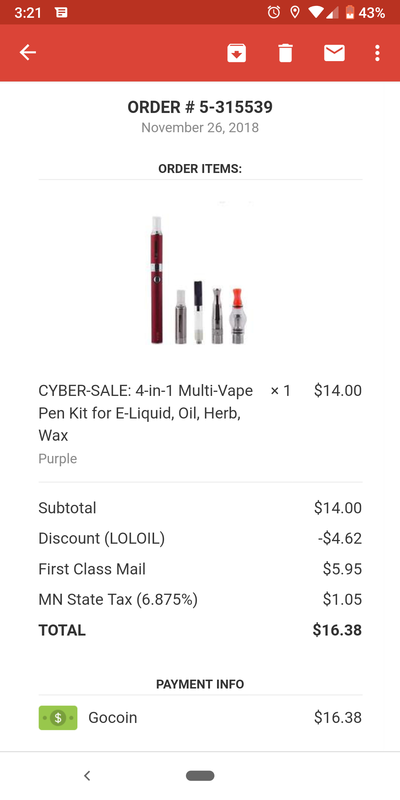 This was only my second purchase ever with cryptocurrency! I like to learn as I go. I remember best when I put words into practice. 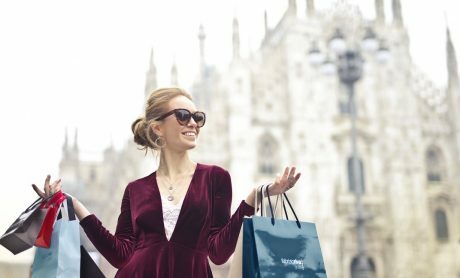 I made one mistake along the way with this transaction which wasn’t critical (or expensive) and all I did was follow the indicated steps and my shoppers intuition. I can guarantee I won’t make that mistake again. 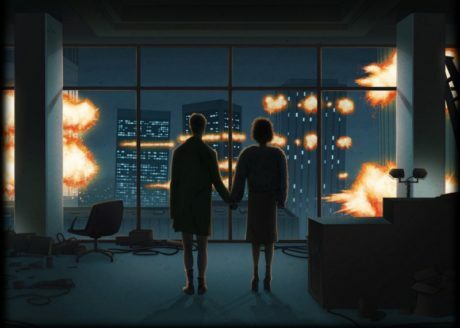 Later I will tell you the mistake I made so that you can learn not to make the same one. As usual, choosing the item that made sense for me was the most difficult and time consuming part. Checkout was a quick couple of steps, like checking out with a credit card. 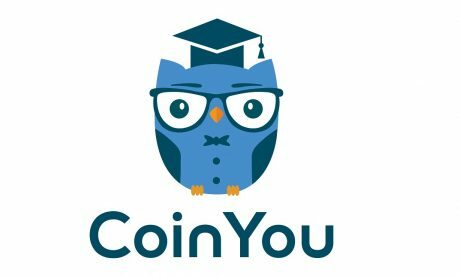 Choosing payment method and crypto type. 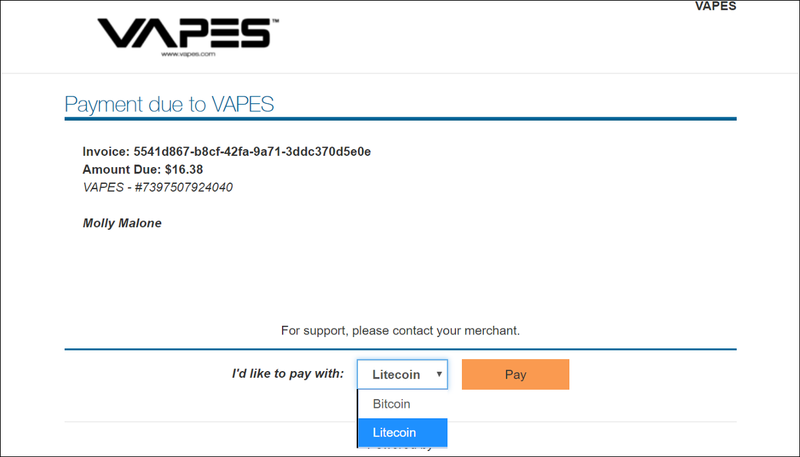 First image: Vapes.com webiste, Second image: GoCoin site. 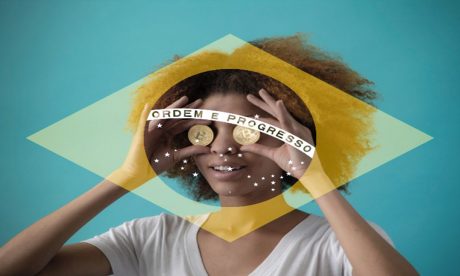 I chose Litecoin for one reason: I had already bought something with Bitcoin and I wanted to see if buying something with Litecoin would be as fast. Spoiler: They were both so fast I couldn’t tell which was faster. 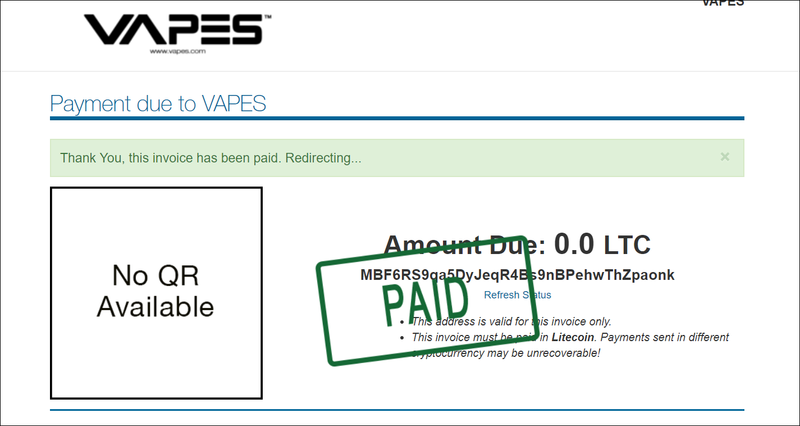 I was redirected to the third party site that processes the crytpo transactions for VAPES, GoCoin. This is where I selected Litecoin. I had a feeling that after this I would need to have my wallet or exchange ready to go for the payment. From my (one and only) previous crypto purchase, I learned the price in crypto has a clock on it. It makes sense. Crypto is volatile. 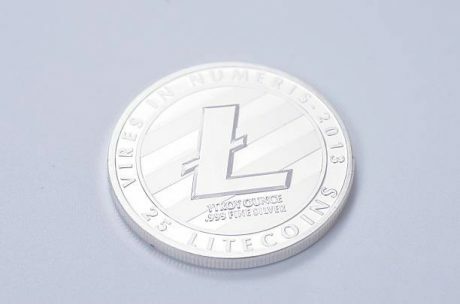 The vendors can’t leave the conversion open for long periods of time because $10.00 USD is not worth the same amount of Litecoin now as it will be in one hour. I was allowed 15 minutes to make my transaction for the exchange rate at that moment. I copy and paste everything when doing this. In order to help my brain recognize that the address is complete, I double check the first and last 3 symbols in the address. 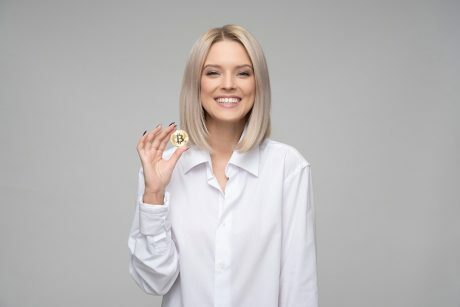 I also copy and paste the quantity of crypto into the wallet or exchange so I don’t transpose any numbers. Great idea in theory, didn’t work so well in practice, unfortunately. I didn’t account for the transaction fee. So, when I clicked Refresh Status on the GoCoin page, I got an unpleasant message: I hadn’t sent enough coin! I was 0.001 LTC short: approximately 3 cents. 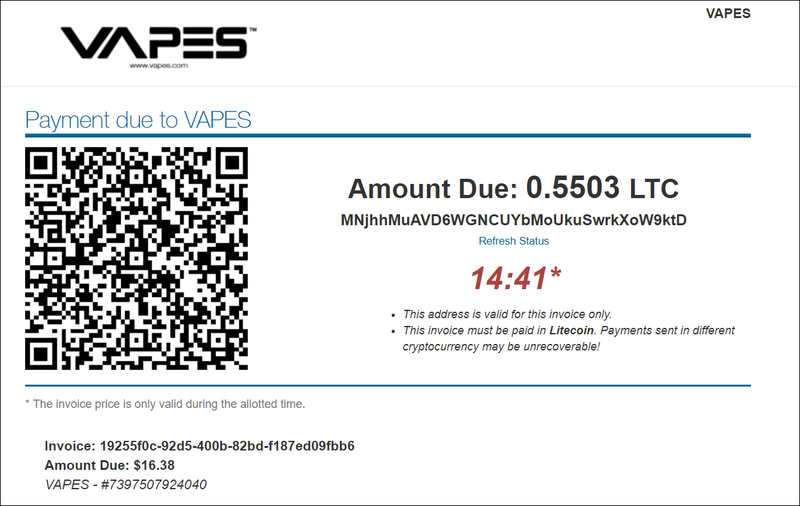 Emails from GoCoin and Vapes.com. Left: Underpaid by a few cents. Right: purchase confirmed and payment info was crypto. 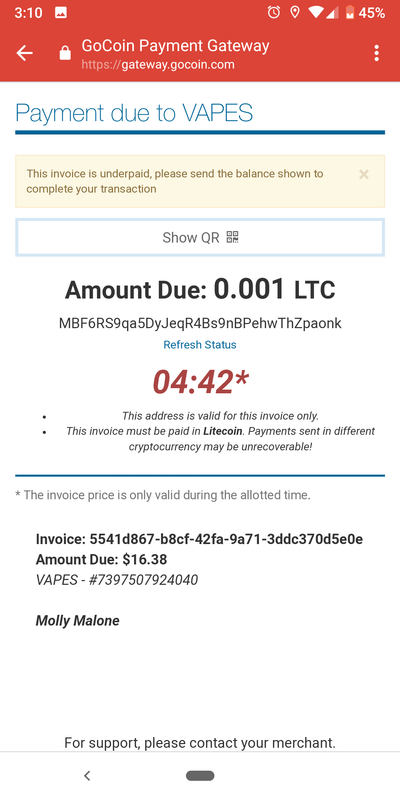 I hurried back to Binance and put in the address again to send the rest of what I owed 0.002 LTC. Why 0.002 when I was only short 0.001 LTC? The transaction fee! I had to pay the transaction fee twice. Oops. Roughly 3 cents wasted. 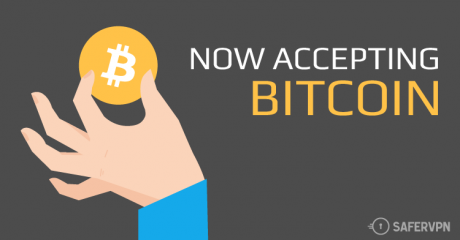 Thankfully, transaction fees are pleasantly minimal. 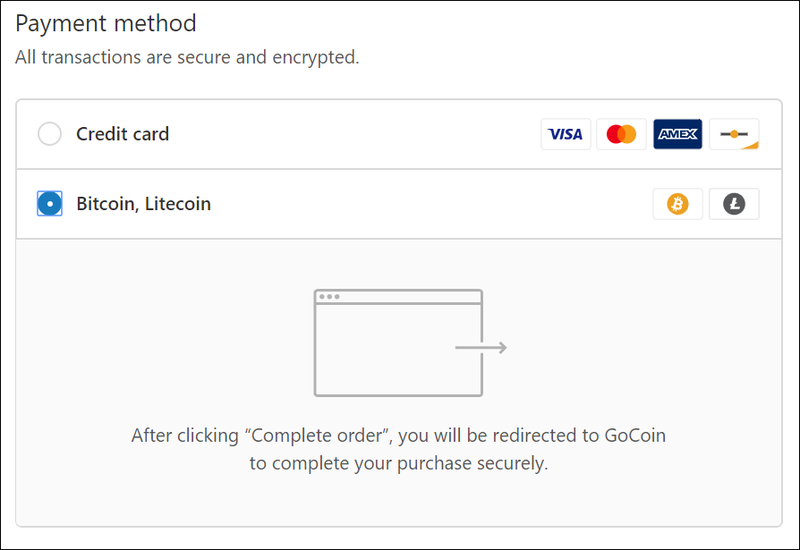 The last few pennies made their way over to GoCoin and I got the good news. It worked! Have your wallet open before you get to the checkout. You can use a mobile app for this or a secure hardware wallet like Trezor. 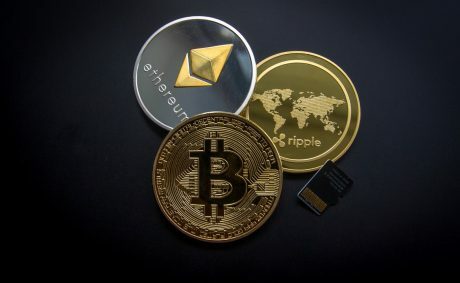 Double check that the merchant will receive the correct amount of crypto after the transaction fee has been collected. Check your email while doing these things. Email updates are often the first to come through to confirm or correct transactions. 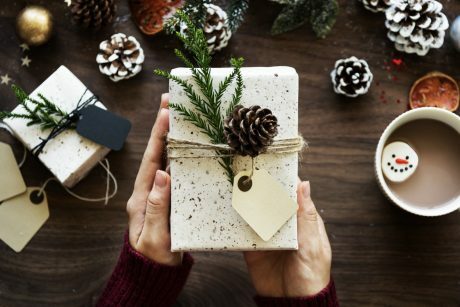 0 responses on "Shopping Online with Crypto"